Not to be confused with Penan. An elderly Punan man performing Bungan rites. Photo taken at Punan Sama village. 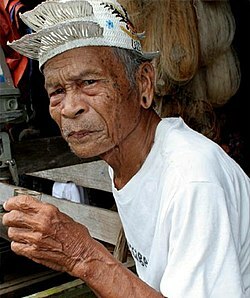 Punan Ba or Punan is an ethnic group found in Sarawak, Malaysia and in Kalimantan, Indonesia. The Punan Bah people are distinct and unrelated to the semi-nomadic Penan people. Their name stems from two rivers along the banks of which they have been living since time immemorial. They do have other names: Mikuang Bungulan or Mikuang and Aveang Buan. But those terms are only used ritually these days. The Punan (or Punan Ba) have never been nomadic. In the old days,[when?] they based their living on a mixed economy – Swidden agriculture with hill paddy as the main crop, supplemented by a range of tropical plants which include maniok, taro, sugar cane, tobacco, etc. Hunting, especially wild boar, fishing, and gathering of forest resources, are the other important factors in their economy. However, in the late 1980s, many Punan, notably the younger, more educated, gradually migrated to urban areas such as Bintulu, Sibu, Kuching and Kuala Lumpur in search of better living. However, they didn't abandon their longhouses altogether. Many would still return home, especially during major festivities such as Harvest Festival or Bungan festival as it is known among Punan. Punan is a stratified society of 'laja' (aristocrats), 'panyen' (commoners), and 'lipen' (slaves). This determines their historical traditions that have been preserved. Just like most of the history of European Middle Ages is linked to and mainly concerned the various ruling monarchs, so are the historical and mythical traditions of Punan closely connected to their rulings aristocrats. 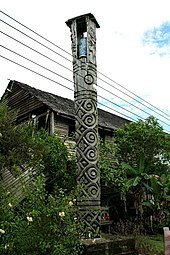 Kelirieng or burial pole at Pandan, Bintulu. This kelirieng was erected for a Punan aristocrats at Pandan or Pedan as it is known to the Punan. Kelirieng is a uniquely Punan ancient burial custom which the other ethnics namely the Kejaman, Lahanan, Kayan later adopted (copied). There is this common misunderstanding that all the so-called Punan on the island of Borneo are related and referring to the same tribe. In Sarawak, for example, there is the confusion between Punan and Penan. On the other hand, throughout the island of Borneo, the term Punan often indiscriminately used referring to the then (unknown or yet to be classified) tribes as such as Punan Busang, Penihing, Sajau Hovongan, Uheng Kareho, Merah, Aput, Tubu, Bukat, Ukit, Habongkot, Penyawung as Punan. This heritage from colonial times still remain until today. Officially, as under the Sarawak Interpretation Ordinance, Punan is group under Kajang together with Sekapan, Kejaman, Lahanan and Sihan. Unofficially, they are also included in the politically coined term Orang Ulu – popularised by a political association known as Orang Ulu National Association or (OUNA). The association is a Kayan and Kenyah dominated association which they established in 1969. Punan are mostly found around Bintulu, Sarawak. Punan peoples can only be found at Pandan, Jelalong and Kakus in Bintulu Division; along the Rajang River, their longhouses dotted areas spanning from Merit District to lower Belaga town. The Punan are believed[by whom?] to be one of the earliest peoples to have settled in the central part of Borneo, the Rajang River and Balui areas together with the Sekapan, Kejaman and Lahanan. However, the mass migrations of Kayans, subsequently followed by the warfaring Ibans into Rejang and Balui areas approximately some 200 years ago, forced the Punan communities living in these areas retreating to Kakus and subsequently to Kemena basin. Punan Lo'o Buong (Jelalong also known as Rumah Adi. The total Punan population is estimated to be around 3000–5000 people. Bungan Gathering of Bungan followers at Punan Sama. Belaga Punan tribe. Punan speak the Bah-Biau Punan language, one of the Rejang–Sajau languages. 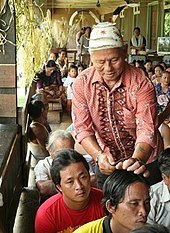 Although often confused with Penan, Punan is closer to the language spoken by the Sekapans and Kejamans. 1. Nu denge? - How are you? 2. Nu ngaro no? - What is your name? 3. Piro umun no? - How old are you? 4. Tupu koman si - Do you have your lunch/diner/breakfast? Punan traditional religion was a form of animist known as "Besavik". The Brooke era saw the arrival of Christian missionaries, bringing education and modern medicine into Sarawak. But the Punan communities remain with their traditional religion of Besavik and subsequently adopting a cult religion - Bungan brought by Jok Apui, a Kenyah from Kalimantan. However, the late 1990s showed an increase in the number of Punan converting to Christianity. This is partly due to more and more Punan becoming educated and modernised. As of 2006, almost half of Punan are now Christian, leaving only the elderly, less educated still remain observing "Bungan" religion. The Punan have a unique burial custom. In the early days they did not bury their aristocrats or lajar. Instead they built a pole known as kelirieng of 50-meter height to lay down their beloved leaders. In Sarawak it is estimated that there are fewer than 30 kelirieng left standing. The Punan still practise a secondary burial ceremony, whereby the dead body is kept at their longhouses for at least 3–7 days. This is partly to give more time for far-away relatives to pay their last respects to the deceased. Persatuan Kebangsaan Punan (Punan National Association), Malaysia. Yayasan Adat Punan (Punan Culture Foundation), Indonesia. ^ Nicolaisen, Ida. 1976. "Form and Function of Punan Ba Ethno-historical Tradition" in Sarawak Museum Journal Vol XXIV No. 45 (New Series). Kuching. ^ Wendy Hutton (2000). Adventure Guides: East Malaysia. Tuttle Publishing. ISBN 962-593-180-5. ^ a b Peter G. Sercombe & Bernard Sellato (2008). Beyond the Green Myth. NIAS Press. ISBN 87-7694-018-7. ^ a b Vandana Shiva (2014). Wendell Berry (ed.). The Vandana Shiva Reader. University Press of Kentucky. ISBN 0-8131-4699-2. ^ Bernard Sellato (1994). Nomads of the Borneo Rainforest: The Economics, Politics,and Ideology of Settling Down. University of Hawaii Press. p. 18. ISBN 08-248-1566-1. ^ Bernard Sellato & Peter G. Sercombe (2008). Beyond the Green Myth: Borneo's Hunter-Gatherers in the Twenty-First Century. NIAS Press. p. 121. ISBN 87-769-4018-7. ^ Lake' Baling (2002). Jérôme Rousseau (ed.). The Old Kayan Religion and the Bungan Religious Reform. Institute of East Asian Studies, UNIMAS. ISBN 983-9257-23-4. ^ Jonathan Chia (11 April 2013). "Independent body for natives urged". The Borneo Post. Retrieved 5 November 2016. ^ Severianus Endi (12 March 2010). "Nenek Renta Itu Berubah Jadi Kodok". Kompas. Retrieved 5 November 2016. Note: There is still lack of literatures on Punan peoples. Available information about these peoples were often sourced from either passing notes written by Brooke and Colonial administrators not in-depth scholarly research. The earliest? literature on Punan is probably one written by Eduardo Beccari, an Italian botanist and traveller in 1876?. In the late 1950s, Rodney Needham, Tom Harrisson, de Martinoir wrote a brief notes on Punan people they either personally met or heard from their guides along the Rajang river. Because of the lack of information many have confused them for Penan and also the Punan of Kalimantan. In Sarawak for example the Punan was wrongly classified as Penan by the National Registration Department in the late 1990. They are also often confused for a politically coined term such as "Kajang" and "Orang Ulu". As such the Punan through their association Punan National Association is willing to collaborate with both foreign and local scholars who interested in doing social, economic research among the communities. Nicolaisen, IDA. 1976. Form and Function of Punan Bah Ethno-historical Tradition in Sarawak Museum Journal Vol XXIV No. 45 (New Series). Kuching. Leigh, MICHEAL. 2002. Mapping the People of Sarawak. UNIMAS. Samarahan. Wikimedia Commons has media related to Punan.